Potato, peanuts and onion wrapped in pastry then deep fried. Served with sweet plum sauce. Deep fried rice pastry filled with mixed vegetables, peanuts, corn and vermicelli. Served with plum sauce. Steamed and served with chilli and soy sauce. Chicken fillets marinated in twelve different Thai spices then grilled and served with golden tasty peanut sauce. Pork tenderloin strips marinated with herbs, grilled and served with tamarind chilli sauce. Deep fried fresh tofu served with our homemade peanut sauce. Minced fish fillets mixed with curry paste and herbs then deep fried. Served with grounded peanuts and plum sauce. Prawn and minced pork wrapped in egg pastry. Roast duck, cucumber and carrot wrapped in rice pastry and hoi sin sauce. Calamari rings coated in bread crumbs then deep fried and served with sweet chilli sauce. A selection of Thai satay, spring roll, curry puff and deep fried calamari. Traditional Thai soup cooked with king prawns, lemon grass, kaffir lime leaves, fresh mushrooms, baby corn and tomato. Creamy coconut soup cooked with chicken, lemon grass, fresh mushrooms and baby corn. A combination of fish, scallop, calamari, prawns in a lemon grass soup with baby corn, tomato, fresh mushrooms and basil. Minced chicken or pork with coriander, mint, chilli, red onion and lime dressing. King prawns with coriander, mint, chilli jam, lemongrass, shallots and lime leaves. Grilled beef tenderloin with coriander, mint, chilli, red onion, tomato, cucumber and lime dressing. Grilled marinated beef sirloin with a Northern Thai style chilli and tamarind sauce. Served medium rare. Sliced roasted duck tossed with coriander, mint, chilli, red onion and lime dressing. Tossed with shredded green papaya, tomato, chilli, lime dressing and roasted peanuts. Shredded green papaya, tomato, chilli, lime dressing and roasted peanuts served with crispy soft shell crab. Grilled Salmon cutlet served with a North Eastern Thai Style dressing of roasted chilli, lime leaves, mint, shallots and ground rice. A savoury and sour northern Thai pork curry with chilli, garlic, ginger, onion and tamarind. Red curry paste cooked with coconut milk, bamboo shoots, basil leaves and selected vegetables. Green curry paste cooked with coconut milk, bamboo shoots, basil leaves and selected vegetables. Hot country style curry cooked with garlic, basil and mixed vegetables (no coconut milk). Hot creamy red curry cooked with lime leaves, basil and fresh chilli. A mild creamy peanut red curry cooked with fresh kaffir lime leaves. Aromatic turmeric curry with coconut milk, potato and onion. Sweet mild coconut cream curry cooked with potato, peanuts and onion. Roasted duck with red curry paste, coconut milk, lychee, pineapple and cherry tomato. Slow cooked lamb cutlets with baby potato and massaman curry. Homemade curry paste cooked with coconut cream, chilli, basil, served with grilled asparagus and eggplant. Roasted cashews stir fried with sweet chilli jam, garlic and selected vegetables. Red curry paste stir fried with garlic, chilli, capsicum and snow peas. Stir fried fresh garlic, pepper and selected vegetables. Stir fried fresh ginger, onion, broccoli, capsicum and shallots. Thai basil stir fried with garlic, chilli, onion, capsicum and snow peas. Stir fried garlic, oyster sauce and selected vegetables. Sliced chicken breast fillet cooked with our homemade peanut sauce and selected vegetables. Tomato base sauce with onion, cucumber, pineapple and selected vegetables. A combination of chicken, beef and pork stir fried with sweet chilli jam, onion, broccoli and carrot. Prawns, fish and scallops stir fried with hot green peppercorn, Thai ginger, chilli, onion and lime leaves. Marinated king prawns cooked with shallots, chilli, onion and fresh turmeric. Fried soft shell crab served with our home made curry sauce, chilli, crispy basil leaves, coconut cream and grilled asparagus. Stir fried salmon cutlet with green peppercorn, Thai ginger, chilli, onion, crispy basil and lime leaves. Grilled salmon cutlet topped with chilli curry sauce, coconut cream, basil, eggplant and asparagus. Whole barramundi fried and served with 3 flavoured spicy, sweet and sour sauce. 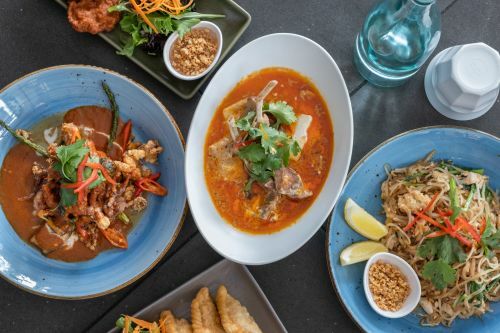 Lightly battered whole barramundi topped with red curry paste, coconut cream, chilli, basil and lime leaves. Flat rice noodles stir-fried with egg, shallots, sprouts and crushed peanuts. Thick fresh rice noodles stir-fried with dark soy sauce, egg, carrot and Chinese broccoli. Thick flat rice noodles cooked with chilli, basil, capsicum, broccoli and green peppercorn. Stir fried glass noodles with crispy pork belly, chilli, water spinach, Napa cabbage and snow peas. Stir fried spaghetti with chilli, basil capsicum and green peppercorn. Rice noodles in a creamy coconut broth with chilli, fried eschalot, tofu and sprouts. Thin rice vermicelli stir fried with egg, onion, capsicum, sprouts and shallots. Stir fried hokkien noodles with egg, broccoli, sprouts & carrot. Served with a side of peanut sauce. Thai style fried rice with chicken, egg, peas, corn & diced carrots. Tom yum flavoured fried rice with chicken, Spanish onion, cherry tomato, broccoli and shallots. Fried rice with crispy pork belly, egg, chilli, garlic, basil and Chinese broccoli. Thai style fried rice with king prawns, egg and vegetables.